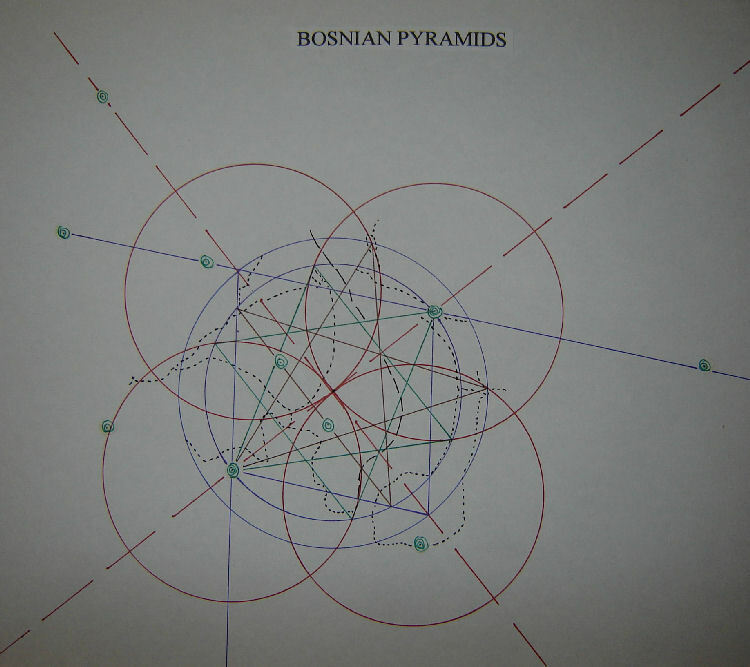 Templar Mechanics has been contacted by Richard Hoyle, a researcher currently involved in the study of the recently discovered Bosnian pyramids near Visoko. For anyone interested in the Bosnian pyramids there are numerous articles on the web as well as you tube videos …some of which I have embedded in this Bosnian Pyramid article further down. Richard asked if I would take a look at the Bosnian site for any possible grid arrangement. 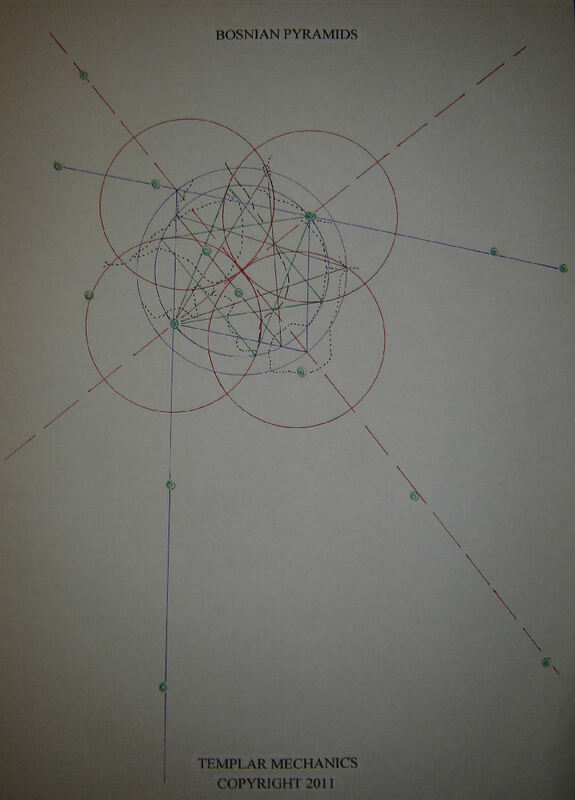 Richard had already made his own ‘in roads’ regarding geometric arrangements in the area and has made several you tube videos, one of which I have included below. I have placed Richards e mail address below in case anyone wishes to contact him directly. 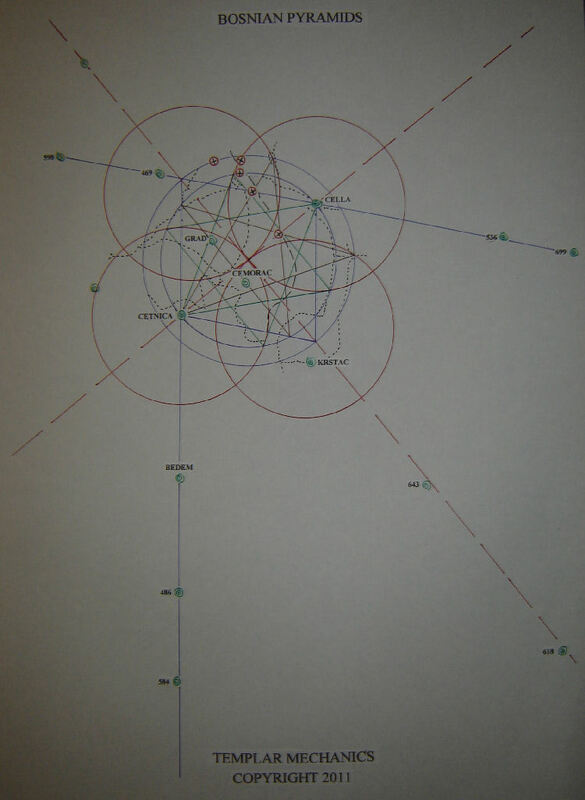 Within one area there may be several grids present all working beyond time flicking on and off or morphing into new ones…as such points may change use as well as physical additions made i.e churches added. Personally, I believe they give and collect energy in line with the prevailing frequency of the dimensional construct, which is always in a state of flux. Human emotional energy facilitates the process. 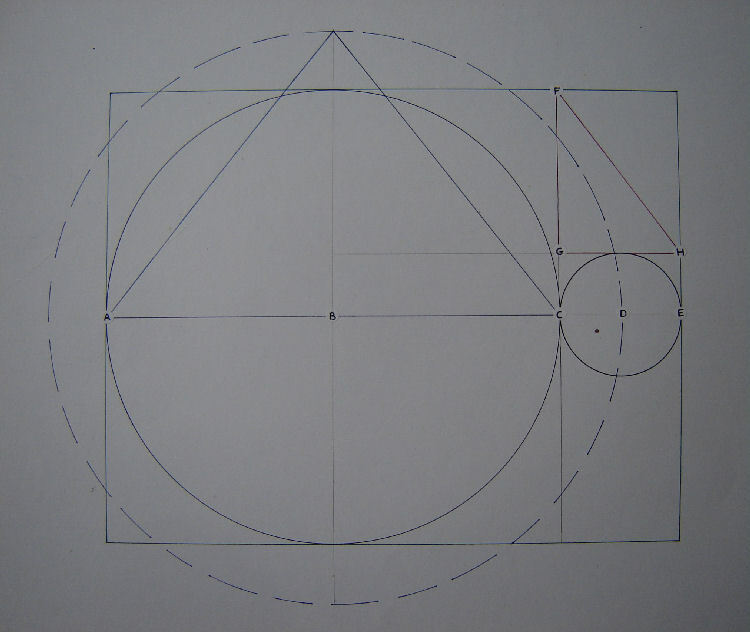 Once recognised and acknowledged the grid is open to interaction at node points…a reciprocal relationship can then develop between architect/cosmos and human subject ….this occurred at all major ancient grid sites …becoming known as sacred sites for that very reason. Churches or religious building regardless of period dating will fall in with the landscape grid. ….religious buildings when looked at without ‘pre conditioned social filters’ are places where people gather to release emotion of one sort or another….in essence a ‘dairy’.
. Pyramids in Bosnia ? Some ‘experts’ are dismissing the Bosnian pyramid discoveries and as such conveniently side stepping awkward questions like…What are pyramids doing in Bosnia ?....Who/What is responsible for their construction ?...and….Why are they there? Not being tied to an academic discipline, or out to defend one ….I was more than happy to take a fresh look through the focused lens of the TM study. Sliding various templates over the area I was looking for the familiar values…36, 108, 54, 72 relating to pentagonal dynamics as well as 51.51 pyramid values. Two sets of alignments fell in a treat connecting in total 9 high points and a church. 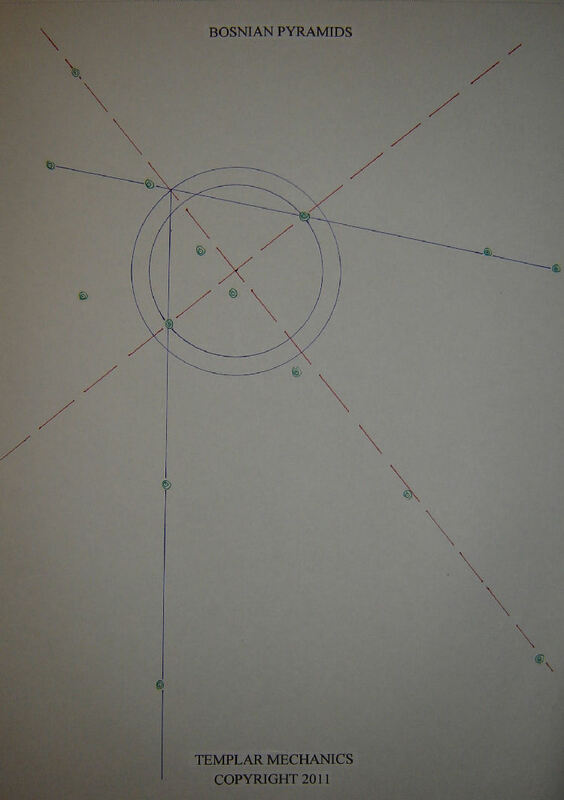 Connecting CETNICA through to CELLA….gave base line with a 51 degree triangle created by the two alignments.This then gave the two circles illustrating Earth / Moon proportions being present…see graphic below for Earth / Moon /51.51 GP illustration. 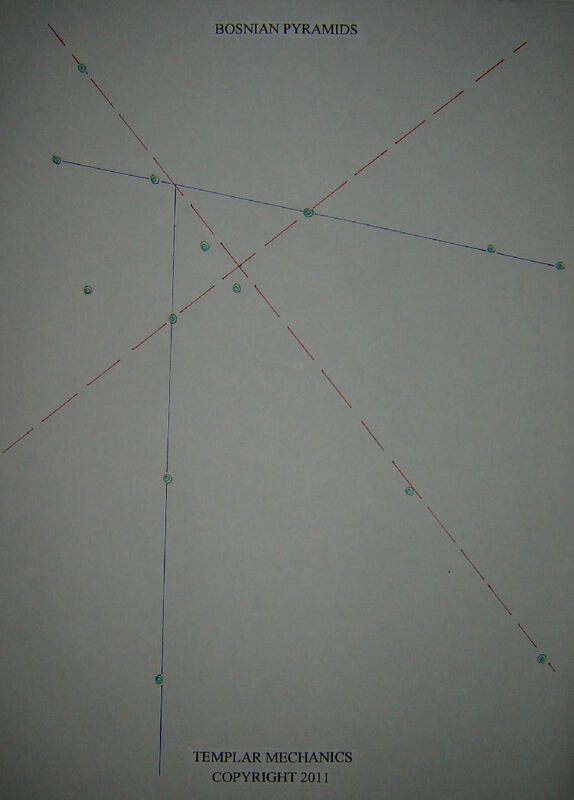 More confirmation came after drawing what would be the base axis line of the pyramid as this connected CETNICA and CELLA….splitting the line gave me the other axis going N/W - S/E. Finding the middle of the base line connecting CETNICA and CELLA I tried a circle which brought in another church on the circumference….CETNICA looked to have a circular base measure replicating another circle the same size ….drawing this second circle in meant using the CETNICA base pyramid line as another centre, which meant this circle passed through the center of the first creating the familiar Vesica Piscis arrangement. 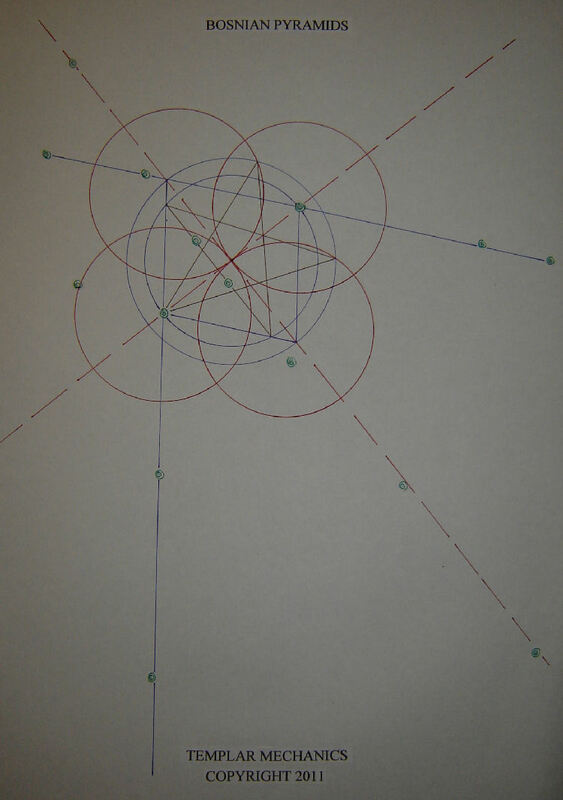 If CETNICA was a center... was the opposing CELLA point also another center?.....Drawing in the third regular sized circle balanced the system…and also brought in another church/mosque on the circumference of the new circle. The familiar 51 pyramid was now calling out to be completed with the Earth / Moon circle to the pyramid apex which was also at the meeting ‘point’ of the first two original alignments that opened the door to everything else….This brought in another church on the circumference of the new circle….another church/mosque then appeared on the pyramid line from apex to CELLA. 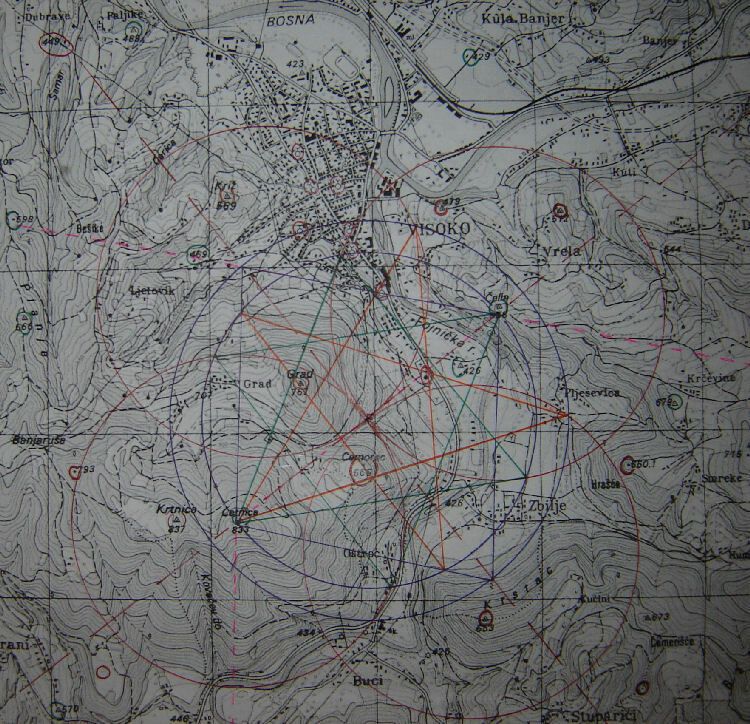 Incidentally where the pyramid line crossed the very first circle that runs through CELLA and CETNICA made a perfect alignment through the peaks of GRAD and CEMORAC to the opposing point, making a great shoulder line for an evolving extended pentacle. Taking a line 18 degrees off either side of CETNICA showed the way forward…connecting back from the newly forming penta legs to the GRAD/CEMORAC shoulder line completed the extended penta arrangement. As if more confirmation were needed these two penta lines crossed exactly on a church conveniently situated on the Main axis connecting CELLA with CETNICA. Looking at the very centre of the system showed a merging of contour features not uncommon to other centres such as Temple Rockley …where the land features come together from all sides. Never to be overlooked , experience has shown they always fall in with a grid if ones present, the Bosnia grid was no exception showing beautiful correlation round the system marked as black dotted lines. ...especially the green hex / star of david / hierophant lines and points. Is the universe saying hello, sit up and take note because it has something else to show you ! Soon after working on the Bosnia system another geomancer, Hugo Kennes contacted me regarding possible land pyramids discovered in Indonesia…..links below. Hugo did not know I had been in contact with Richard or working on the Bosnian Grid.